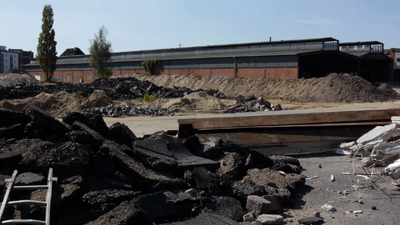 The Film “Bodenerhebungen / Grounds Rising” focuses on recent changes in the district of Altona, in Hamburg / Germany. On former railway-owned grounds the “New Heart of Altona” is being built with a public park that is meant to integrate heritage protected relics. Only that past residents from crafts, art and music who had made use of the formerly neglected landmark buildings are definitely not meant to be integrated in the new rise of the area. Mario Bloem, Birgit Gebhardt, Frank John, Hermann Jonas, Prof. Dr. Ing Ursula Kirschner, Angela Rieke, Dipl. Ing Frank Schwieger, Prof. Jörn Walter u.a.